The earliest evidence of criminology at the University of Nebraska at Omaha can be traced to T. Earl Sullenger. Professor Sullenger taught at the university (then the University of Omaha) from 1923 to 1958 and founded the sociology department. He frequently offered courses on criminology and related topics, and he also published a number of books and articles on issues related to crime and deviance. Some of his work can be found in journals such as American Journal of Sociology, Journal of Criminal Law and Criminology, and Social Forces. Professor Sullenger also contributed a chapter on crime in Omaha to Clifford Shaw and Henry McKay’s classic study Juvenile Delinquency in Urban Areas. 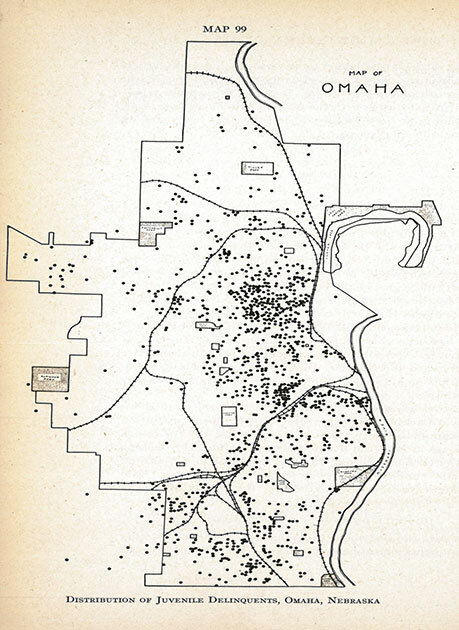 Map of juvenile delinquents in Omaha, compiled by T. Earl Sullenger for Juvenile Delinquency in Urban Areas. The sociology department continued to offer criminology courses into the 1960s. In the fall of 1962, however, the College of Adult Education, with assistance from faculty from the sociology department, began offering a bachelor of science degree in law enforcement and security. In fall of 1966, the department of law enforcement and correction was formed under the direction of Professor Gaylon Kuchel. In the summer of 1966, eight students (including one woman) became the first graduates of the program. The program quickly grew in numbers and expanded to include an associate degree, which produced its first graduates in summer of 1967. In 1971, the department received funding from the Nebraska State Commission on Law Enforcement and Criminal Justice to develop a degree program on the Lincoln campus of the University of Nebraska system. Beginning in the fall of 1972, several full-time faculty were assigned to the Lincoln campus and students were offered the opportunity to complete their bachelor of science degree in law enforcement and corrections from the University of Nebraska at Omaha entirely on the Lincoln campus. In 1972, the department of law enforcement and correction became the department of criminal justice and moved to the School of Public Affairs, which became the College of Public Affairs in 1973. The department received a grant from the Law Enforcement Assistance Administration in 1973 that required the department to join an informal five university consortium that would investigate and develop graduate-level education in criminal justice. In 1974, the department hired three new faculty members, William “Bill” Wakefield, Samuel Walker, and Vincent Webb, to assist with this goal. Professor Webb was appointed chair of the department in 1975, a position he held for most of the next 20 years. In 1976, both a master of science degree and a master of arts degree in criminal justice were approved by the Board of Regents. During the 1970s, '80s, and '90s, the department continued to grow in enrollment and faculty on both the Omaha and Lincoln campuses. The department also became recognized as a national leader in criminological education and research. In 1993, the Board of Regents approved a doctoral degree in criminal justice, the first free standing Ph.D. program to be offered by the University of Nebraska at Omaha, and the 13th such program nationally. The first cohort of Ph.D. students was admitted in 1994, and Charles Katz and Ni “Phil” He were the first graduates of the program in 1997. After the creation of the doctoral program, the department continued to expand its focus on graduate education and research. In 2006, the department of criminal justice broadened its mission and scope by becoming the school of criminology and criminal justice. At that time, the school boasted a top ten national rank according to U.S. News and World Report, was home to a large, well-respected, and productive faculty spread across the Omaha and Lincoln campuses, and housed an affiliated Juvenile Justice Institute that was established in 2002 to efficiently meet research needs of the Nebraska juvenile justice system. 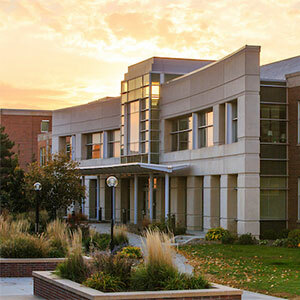 In 2009, the school also established the Consortium for Crime and Justice Research, which has since become the Nebraska Center for Justice Research, in response to a need for more comprehensive research on regional and national crime and justice issues. Now, under the direction of Professor Gaylene Armstrong, the school of criminology and criminal justice remains a nationally recognized leader in criminological research and education. Faculty within the school are actively involved in research activities that impact the field of criminology and criminal justice. Over the years, the faculty members have included several fellows and past presidents of the American Society of Criminology or the Academy of Criminal Justice Sciences. The school also currently serves close to 850 undergraduate students between the Omaha and Lincoln campuses of the University of Nebraska, and approximately 150 masters’ students and 30 doctoral students who are currently pursuing their graduate degrees.